For the month of February, G hotel is coming up with three selections of an 8-course Chinese Dinner ranging from RM1288 to RM1488, but you need to at least book 3 tables (10persons per table) since the dinner will only be served in a private room. It is a good idea if you have a bigger crowd for reunion during the festive season. However, on the Eve of Chinese New Year, you just need to book a minimum of one table to enjoy the fabulous ambience and a sumptuous dinner in their G Hotel Gurney ballroom. 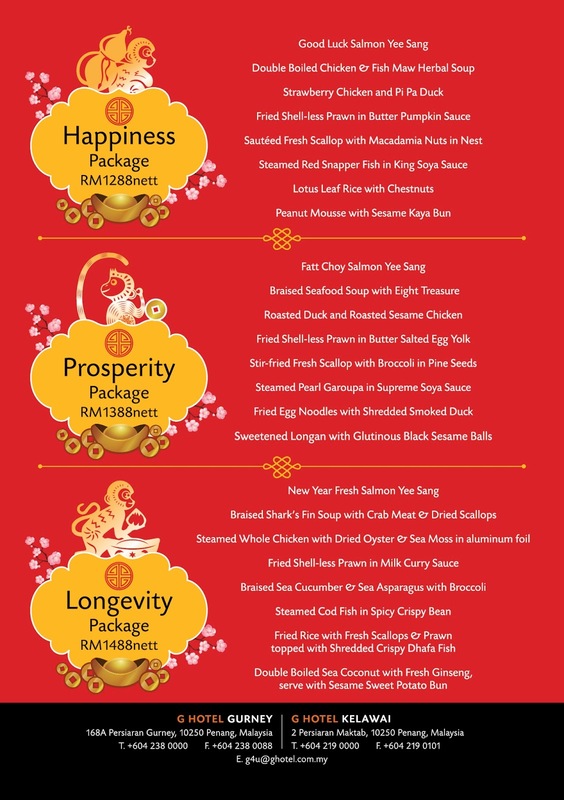 The three selections of 8-course Chinese Dinner are namely Happiness (RM1288), Prosperity (RM1388) and Longevity (RM1488). The review here is based on the Prosperity (RM1388) selection. All prices are net and inclusive of 6% GST. G Hotel has a good reputation for their Chinese cuisine where they are very particular with the quality and the freshness of the ingredients, and while maintaining the Chinese style preparations they also secured a halal status. Among all the dishes we tried, many of us liked the Braised Seafood Soup with Eight Treasure and Fried Shell-less Prawn in Butter Salted Egg Yolk, both are rich in flavor but not overwhelming. According to Christina Tan, Director of Communications at G hotel, their chefs will spend hours to cook just to get the natural flavor from the ingredients, instead of depending on seasoning. The Eight Treasures are Fish lips, Sea cucumber, Dry scallops, Fish maw, Crab meat, Water chestnut, Mushrooms and Bamboo fungus.